Compelling content is an excellent marketing tool, but it can only reach its potential if your readers know where to find it. Newspaper readers will likely be familiar with the “above the fold” concept. If you look at a broadsheet-style newspaper on a store shelf, it will be folded in half. The portion of the paper that’s above the fold is what potential buyers see when glancing at the newspaper rack, which means it’s also the place that editors put the stories that are most likely to sell newspapers. Stories that land above the fold are more likely to be noticed and consumed by readers. Your website isn’t printed on paper and placed on a store shelf, but the concept still applies to web design. Place your best content in the prime real estate above the fold, and you improve its chances of being seen, read, and shared. The bottom line is that compelling content at the top of the page makes users more likely to learn more about your Calgary business. The first challenge you’ll face is that readers access your site from all manner of devices, with screens ranging in size from the smallest smartphone to the largest high-definition desktop monitor. Having a responsive website helps, because a responsive site scales to fit the screen-size of the device used to access it. The fold won’t necessarily fall in the same place on every device, though, even with a responsive site. As the user experience experts at Nielsen-Norman Group put it, the fold online is more concept than measurement, since it’s highly dependent on the size of the user’s screen. On your website, the fold falls where the screen cuts off. In other words, information above the fold is information that users will see without having to scroll. The smaller the screen, the less content fits above the fold. With so many users browsing from smartphones, it’s important to make sure you get the small screen right. Your content is a gateway to your business as a whole. When a reader finds a piece of your content valuable, they’re more likely to continue browsing your site. They might land on another piece of content, or find themselves browsing your online store. Either way, the content that initially catches their eye is what ultimately unlocks the rest of your site. Most Web users will scan a page before making any further commitment. It’s how they read content, and how they analyze your homepage to see if your content is worth reading. Placing your best content above the fold is the perfect way to convince readers that scanning is worth their effort. If a reader doesn’t find something interesting above the fold, they won’t take the time to see what’s “hidden” below. A long page can work, as long as you lead off with quality content. It’s important to keep some balance when choosing where to place your content. Put too much information above the fold, and readers will be bogged down by the crowded page before your content can make an impact. The area above the fold is also important for retaining repeat visitors. If readers consistently find new, interesting content above the fold, they’re more likely to keep coming back. According to extensive eyetracking studies conducted by Nielsen-Norman Group, the area just above the fold is 102 percent more likely to be viewed than the area just below. Considering that over 50,000 people participated in the study, such a stark difference is remarkable. Print newspapers may not be the same media powerhouse as in decades past, but there’s still plenty to be learned from their popular, practical formatting. If you want your site visitors to keep scrolling, you need to give them a reason to do so. Consistently putting your best content above the fold is a relatively simple change that will deliver major results. 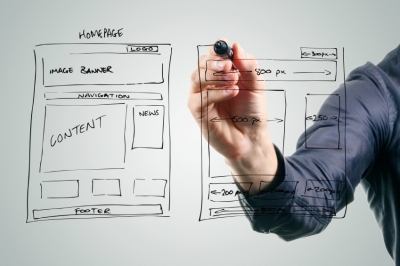 Emphasize Design has the web design tools you need to keep your Calgary business thriving. Start with a look at our formula for success to learn how you can get more leads, for less cost!